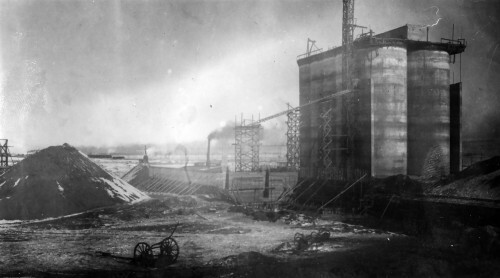 In 1889, the Consolidated Plaster Company of Laramie took advantage of the abundance of nearby gypsum to manufacture stucco and plaster of Paris. Ten years later, the company began making cement plaster. This company was succeeded by Acme Cement Works and continues today as the Mountain Cement Company. In 1898, Omaha hosted the Trans-Mississippi & Industrial Exposition, which showcased the development of the Trans-Mississippi West. Buildings were sponsored by many states, including Georgia and New York. There were more than 4,000 separate exhibits and more than 2,600,000 people in attendance at the exhibition, including President McKinley and Wm. F. Cody. The head of the mining exhibition complained in his report about the disinterest from Wyoming and Montana. Nevertheless, Acme Cement and Plaster of Laramie, Wyoming won a gold medal. Learn more about the Laramie cement plants.